We are located in Dalton, Georgia nestled in the Appalachian Foothills of northwest Georgia. The "Carpet Capital of the World". Famous around the world for quality, style, and innovative technology. If you have shopped for carpet, no matter where you live, chances are that the carpet you saw was made right here in the area by one of the major manufacturers like Shaw Carpet, Mohawk Carpet, Beaulieu Carpet, Coronet Carpet. or one of the many other carpet mills. Savings so significant the "Today Show" featured the area as the best place to buy flooring at outlet prices. 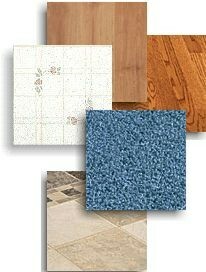 We offer virtually all name brands of flooring. Congoleum DuraCeramic, QuickStep Laminate Floors, Nafco Luxury Vinyl Tile, Mohawk Laminate and Hardwood Floors and many, many more. Look around and if you do not see what you're looking for, call us for our best price.